B) one baby had food poisoning (nausea) from infant milk formula. At the end, the article stresses out that "when we remove the import company label, only then we realize that it’s produced in Azerbaijan." The photo report, consisting of a series of photos of the formula container, shows the producing company's Azerbaijani website, Facebook page and a phone number under the Armenian label. These links do not indicate that the product is produced in Azerbaijan. The author also found that the milk formula was imported by a company owned by a Member of Parliament Arkady Hambardzumyan, which led to many other articles in media outlets. 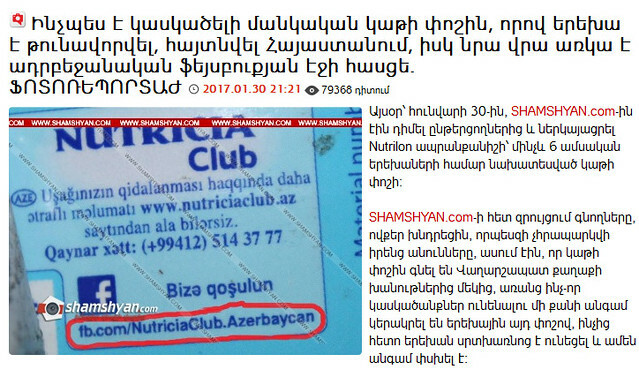 “Arkadik of Derzhava Sells Azerbaijani Infant Formula” and “Member of Parliament Imports Azerbaijani Infant Formula That Already Poisoned a Baby (Photo) Shamshayn.com” articles spread in social media, sparking outrage among people who labeled the MP ungodly, dishonorable, a traitor, and a genetical Turk. This clarification was actively circulated among people participating in the hot debates on Facebook. Despite that, some press and social media users continued to spread unchecked, anonymous information that was based on assumptions and officially denied. For example, Asekose.am published the clarification by FSSS in an article with the following title, "FSSS on the news of the Azerbaijani infant formula imported to Armenia by the Member of Parliament," by first confirming the fake news and then denying it. 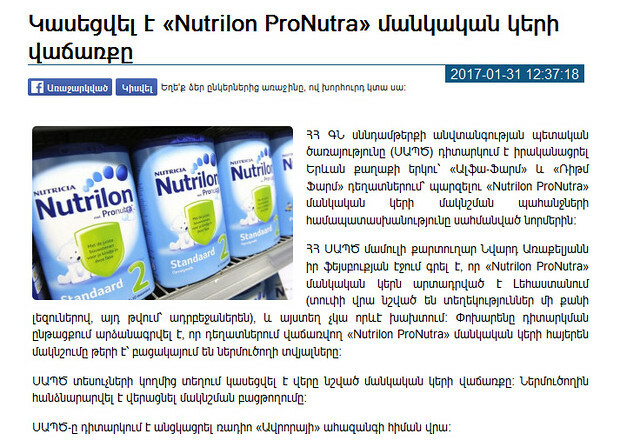 While Lurer.com created another confusion for its readers with an article entitled “Nutrilon ProNutra” infant formula sales are suspended”. The website mixed up the clarification by FSSS with an announcement on the same infant formula a few months ago. 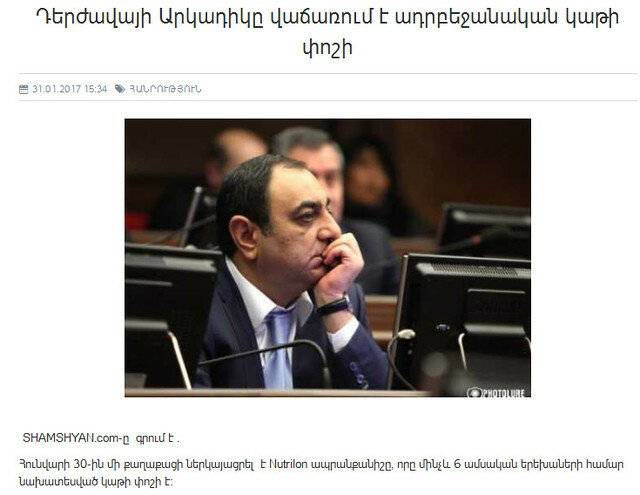 This isn’t the first time that such a panic was created on Facebook and in the Armenian media. In 2015, we had the same picture when some social media and press wrote about how AIDS-infected batches of orange were imported to Armenia. These articles work on speculating national and parental feelings, conspiracy theories and emotional reactions, where fear and anger (preservation of the Armenian gene is still relevant) prevent people from understanding the facts. Speaking about the victory of a convincing lie over the real fact, media specialists refer to the post-truth period, when objective facts are less influential in shaping public opinion than appeals to emotion and personal belief. In 2016, post-truth was included in the Oxford Dictionary. “We first saw the frequency really spike this year in June with buzz over the Brexit vote and Donald Trump securing the Republican presidential nomination. Given that usage of the term hasn’t shown any signs of slowing down, I wouldn’t be surprised if post-truth becomes one of the defining words of our time,” explained Oxford Dictionaries president Casper Grathwohl. After Donald Trump became the US President, international experts and the media started to speak more about the dangerous trend of fake news and possible solutions, mainly through building a media literate and critical thinking audience. The New York Times offers analytical and educational resources on how to distinguish fake news in a post-truth’ world.